Some of the team members and workers of the 2018 excavation season in the Dinka Lower Town. Drone Photo by Andrea Squitieri. Ibrahim Manla Issa (Erbil): cook, 2.9.-15.10. Our team also included six workmen from Nureddin and Qaladze. In September 2018, archaeological work continued in the Lower Town of the Dinka Settlement Complex, in an area dubbed DLT3 (Dinka Lower Town Operation 3). DLT3 is located between Gird-i Bazar and Qalat-i Dinka, about 400 m west of the former. A geoarchaeological trench (called GA42, about 8m x 2m) had been opened in this area in 2015, under the assumption that it was located well past the occupation boundary. However, this trench uncovered several archaeological structures, and in 2016 an extensive magnetic survey revealed that the lower town was much bigger than had been previously thought, extending between Gird-i Bazar and Qalat-i Dinka. A possible pebble floor was just visible in a section of the 2015 trench. A charcoal sample collected from immediately above this floor was radiocarbon dated to 830-789 BC. In light of the subsequent C14 dates obtained from both Gird-i Bazar and Qalat-i Dinka, which all predate the Neo-Assyrian conquest of the Peshdar Plain during the late 9th century BC, the 830-789 BC dating from the 2015 geoarchaeological trench was of particular interest as it fits the period of Assyrian control of the plain. Therefore, it was decided that the 2018 autumn campaign would investigate the area where the charcoal sample was found, by opening a roughly 80 m2 trench (Fig. 1). Fig. 1. 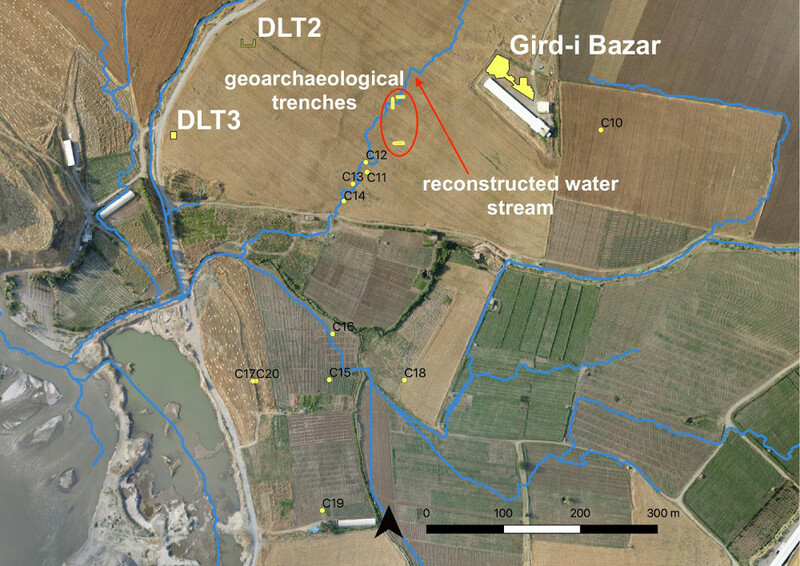 Image showing: 1. the location of trench DLT3 in the Lower Town, 2. the spots where the cores samples were taken (labelled with C), 3. the three geoarchaeological trenches opened in October 2018 and 4. the reconstructed watercourses (in blue) using a SAGA-QGIS hydrological analysis. Prepared by Andrea Squitieri. Background image by ICONEM. One of the main discoveries of this campaign was the identification, for the first time, of Chalcolithic layers just below the Iron Age ones. In particular, a pottery kiln (Fig. 2) was excavated which unfortunately had been partially destroyed by the 2015 geoarchaeological trench. Fig. 2. The Chalcolithic kiln below the Iron Age structures. Photo by Andrea Squitieri. Despite this, it was possible to recognise some of the architectural parts of the kiln, particularly a central column still in situ and remains of curved bricks found in the kiln fill which represent the remains of the kiln floor with holes. 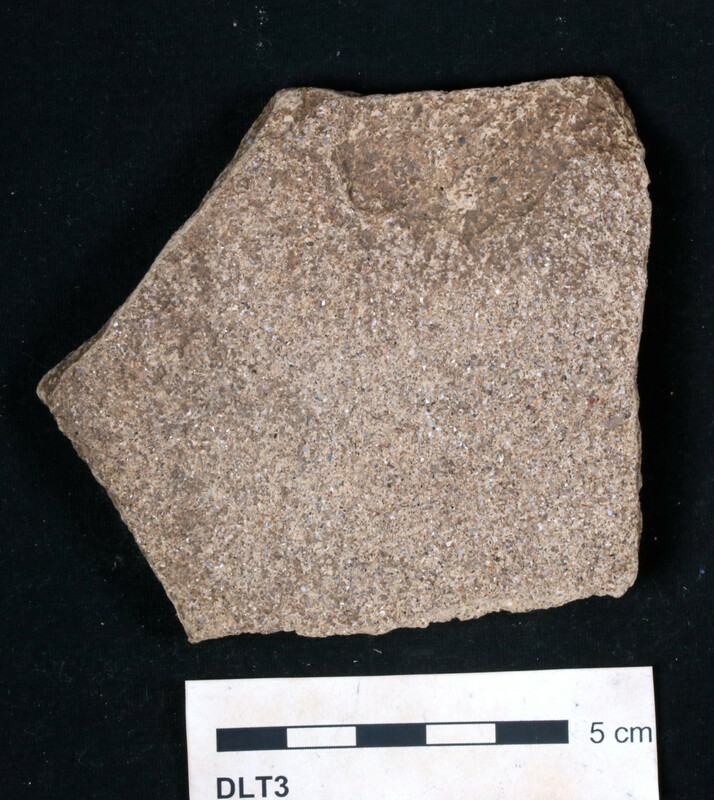 Along with some Chalcolithic pottery sherds, many plano-convex bricks were also found within the kiln fill, which likely came from the vaulted structure covering the kiln’s upper chamber. The upper part of the kiln was destroyed by the construction of the Iron Age wall. It seems, therefore, that the kiln had two chambers separated by a kiln floor supported by a central column. It is not clear whether the kiln was partially underground or stood completely aboveground, though the first option seems more plausible. Because of the Iron Age remains above it, it was not possible to investigate the area around the kiln further. However, a Chalcolithic floor was intercepted opposite the kiln (but not in connection to it) some cm below the Iron Age floor. On this Chalcolithic floor were found several pottery sherds and a few obsidian and flint tools. The Iron Age structures stood above the Chalcolithic layers. Interestingly, two distinct architectural phases have been identified. The older one, called Main Occupation Period 1, was characterized by stone walls, which share the same building technique as the rest of the Lower Town. These walls delineate at least two buildings, dubbed Building S on the west and Building R on the east (Fig. 3). Fig. 3. Final orthophoto of the DLT3 trench. Created by Andrea Squitieri and annotated by Janoscha Kreppner. The physical connection between these two buildings was lost during the excavation of the 2015 geoarchaeological trench. The floors of both buildings were covered with small pottery sherds, displaying the same shapes and techniques as found in the rest of the settlement. 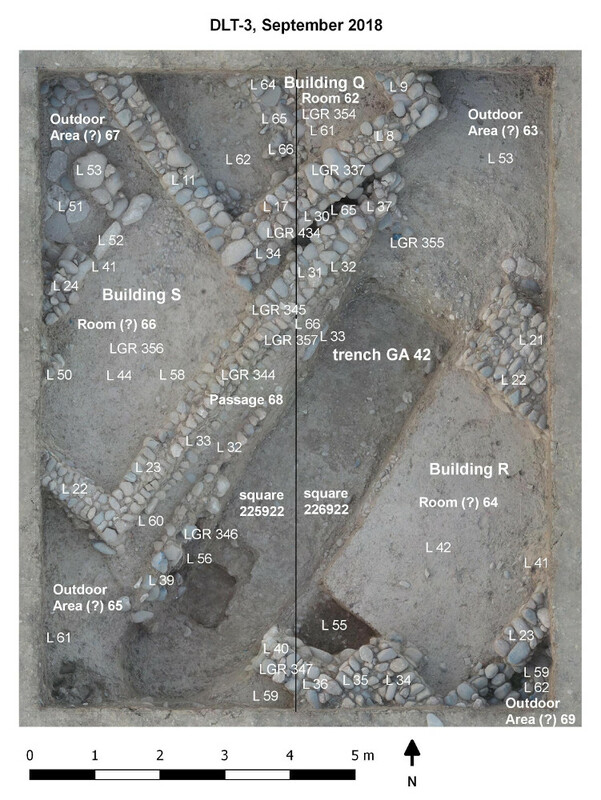 This datum shows that these buildings are roughly contemporary with the others excavated in the Lower Town. At some point in time, after Main Occupation Period 1, a new building called Building Q was superimposed onto Building S in the northern part of the trench, which did not follow Building S’ wall orientation. This indicates that Building Q belongs to a subsequent chronological phase, called Main Occupation Period 2. A second architectural phase (Main Occupation Period 2) has also been identified in Gird-i Bazar; however, there the general layout and wall orientation of earlier buildings were always maintained. The construction of Building Q, on the other hand, suggests a radical change in the function of the older Building S. Building Q’s single room was excavated as far as its floor on which the same pottery as in the Main Occupation Period 1 was found, indicating that both architectural phases fall within the same Iron Age chronological horizon. Under this floor, the older wall belonging to Building S was found, although only partially preserved. In the NE corner of the trench, at the level of the younger floor belonging to the Main Occupation Period 2, and close to an installation only partially uncovered (because of its location underneath the balk), a fragment of a baked brick was found with the remainders of a stamped Assyrian inscription, displaying the end of the first line (Fig. 4). Fig. 4. 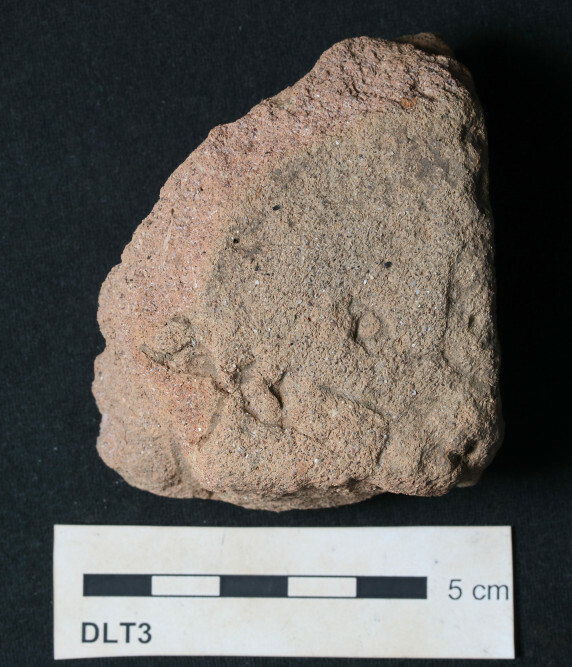 Brick fragment with short cuneiform inscription. Photo by Jean-Jacques Herr. This line ends with the sign KIŠ, the logogram for kiššatu “universe; world”. We can therefor assume with great confidence that the line read “X, strong king, king of the universe”, continuing in the second line with “king of Assyria,” and the genealogy. parallels are e.g. brick inscriptions of Shalmaneser III from Assur (RIMA 3 no. A.0.102.99). The brick surely dates to the time of the Neo-Assyrian occupation. It is tempting to connect this brick to the construction of Building Q and to the Neo-Assyrian period C14 date mentioned above, although further investigation is needed to ascertain such a connection. The identification of Assyrian interventions in the Lower Town is the primary subject of future research at the Dinka Settlement Complex; however, an important datum that has already emerged from the DLT3 trench indicates that the pottery tradition does not appear to change throughout both Main Occupation Periods 1 and 2, although the latter might belong to the Neo-Assyrian period. To clarify this point, several samples (charcoals and seeds) for C14 are undergoing analysis to try to establish the chronological development of the two architectural phases of DLT3. 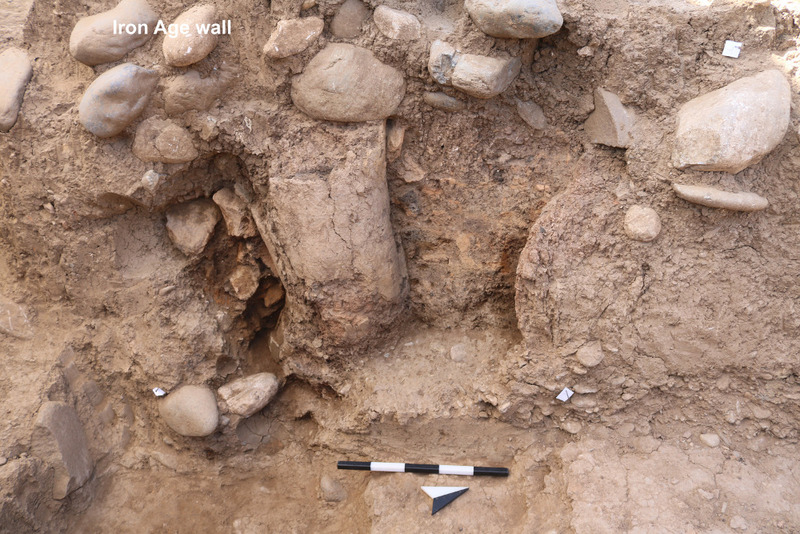 During the last two weeks of the 2018 autumn campaign it was also continued the excavation of the burial discovered inside a well in Gird-i Bazar during the 2017 campaign. These remains are of particular importance for the goals of our project because a C14 analysis from one of the bones has yielded a date spanning from 748-409 BC, which encompasses the period of the Neo-Assyrian occupation of the Peshdar Plain, and it is later than the other C14 dates obtained from the rest of Gird-i Bazar. 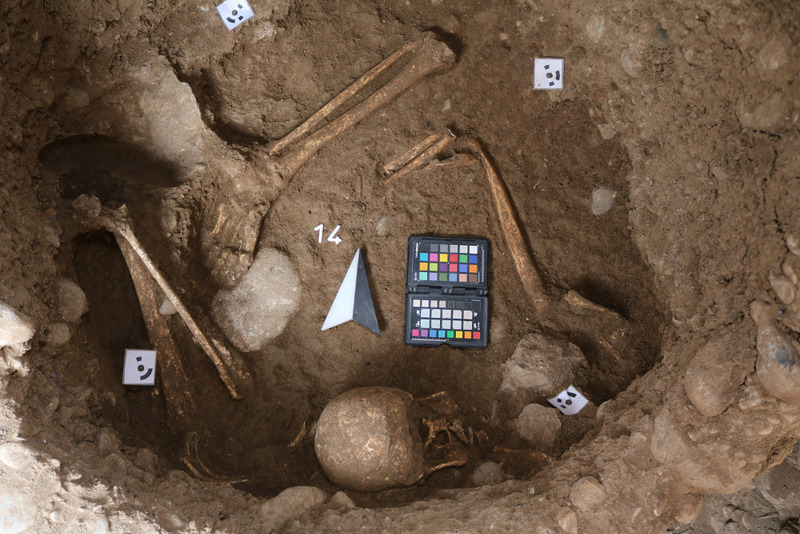 In 2017, the excavation of this burial (called Grave 71) revealed three disarticulated bodies, two of adult women and one of a stillborn child, in the fill of the well in Room 49. This year’s excavation has unearthed the remains of a juvenile and two more adult individuals, of which one may be a male (Fig. 5). A series of analysis is undergoing to gather more information about these individuals whose fate may be linked to the end of occupation at Gird-i Bazar. Fig. 5. Grave 71 in the well of Gird-i Bazar at the end of the 2018 excavation. Photo by Jens Rohde. During the 2018 autumn campaign the magnetometer prospection was continued in both the lower and the upper town. In the former, the easternmost limit of the settlement (east of Gird-i Bazar) has likely been found. In the upper town, specifically on the western slope of Qalat-i Dinka, west of the three trenches excavated in spring 2018, more archaeological features worthy of future investigation have been detected. The first two weeks of October were dedicated to environmental studies across and around the settlement, with three main goals. The first was to understand the formation of the alluvial plain and to establish the ancient course of the Lower Zab river in relation to the settlement. The second was to understand why the 2016-2017 magnetic survey in the lower town revealed a large “gap” area, without any archaeological features, just in the middle of the settlement, and to test whether the DEM-based hydrological analysis which reconstructed a water stream running through the lower town was correct. The third was to create a more detailed geological map of the Bora Plain and its surrounding area in order to have a better picture of the geological sources available to the inhabitants of the settlement. To achieve the first goal, 11 core samples were taken from selected locations across the plain, including the area where the general DEM of the Bora Plain indicated a possible ancient river course (or branch). Some “black” cores, that is collected inside black sleeves, were also taken, in order to date the sediments via OSL analysis and determine when the alluvial plain formed. As for the investigation of the “gap” visible in the magnetic survey in the middle of the settlement, three geoarchaeological trenches about 10 m x 2 m and 2 m deep (called GA43, GA44 and GA45) were opened (Fig. 1). They revealed an ancient wadi (i.e. seasonal river) bed right on the spot predicted by the hydrological analysis, thus confirming that a watercourse crossed the settlement at some point. Further analysis is undergoing to understand whether this wadi was contemporary to the settlement (and if somehow its course was artificially controlled) or it formed later, after the settlement had been abandoned, thus destroying any archaeological structures and creating the “gap” visible in the magnetic survey. During the excavation of the Geoarchaeological Trench 44, located about 200 m west of Gird-i Bazar, some pottery sherds were found a few centimetres below the topsoil. One of them bears a stamped decoration showing the Saint Andrew cross (Fig. 6). This find allows us to posit that the Sasanian-period cemetery excavated at nearby Gird-i Bazar was used by a Christian community. Similar stamped decorated sherds come from elsewhere in North Mesopotamia where a large Christian Nestorian community was present. Fig. 6. Sasanian sherd showing a Saint-Andrew cross decoration. Photo by Jean-Jacques Herr. In summary, the 2018 autumn archaeological investigations of the Lower Town have provided clues to the existence of a second architectural phase, perhaps dated to the Neo-Assyrian period, in which the same pre-Assyrian pottery tradition that characterised the rest of the Dinka Settlement Complex was continued. 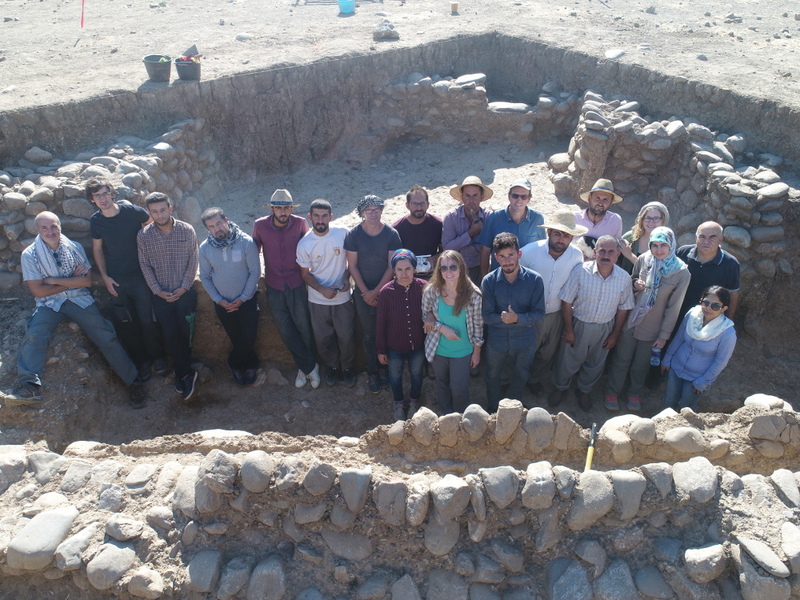 The environmental studies have confirmed that a wadi once crossed through the settlement, and have offered more data that will clarify the formation and the geo-morphological setting of the Bora Plain.